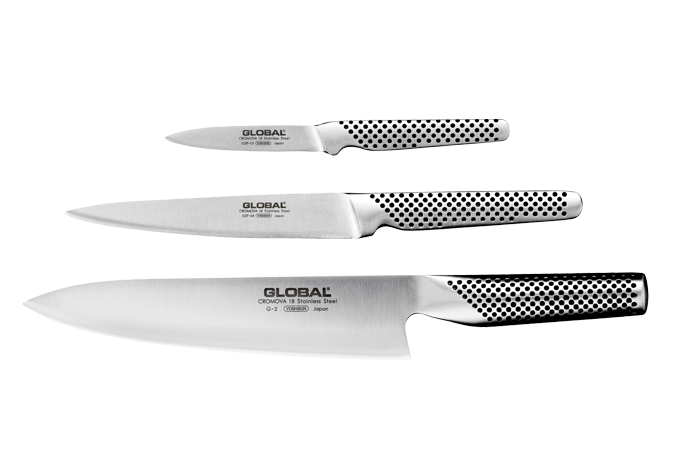 Global Kitchen knives The first Global knife was designed in 1985 by Japanese designer Komin Yamada. With a virtually unlimited budget, he was commissioned by the Yoshikin factories to develop a range of kitchen knives that would appeal both to professional chefs and gourmet cooks at home. The result speaks for itself - the Global knives are renowned, well-loved tools in all sorts of kitchens because of their sharp blades - and the perfect balance of their design makes food preparation a unique experience and a study in perfectly formed tools. Global GF-24 Forskjærsgaffel, 17 cm.